Your work on the last day of the program was truly the highlight of the session. 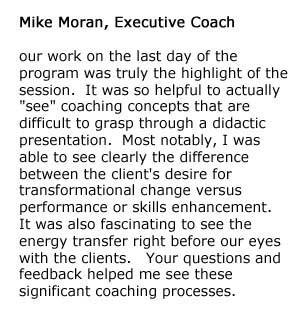 It was so helpful to actually “see” coaching concepts that are difficult to grasp through a didactic presentation. Most notably, I was able to see clearly the difference between the client’s desire for transformational change versus performance or skills enhancement. It was also fascinating to see the energy transfer right before our eyes with the clients. Your questions and feedback helped me see these significant coaching processes.